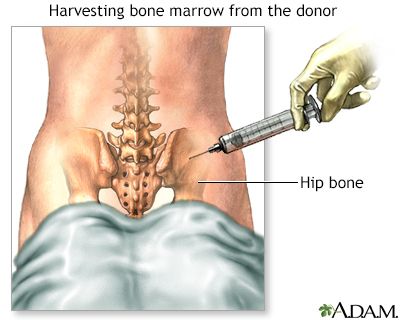 A bone marrow transplant is a procedure to replace damaged or destroyed bone marrow with healthy bone marrow stem cells. Bone marrow is the soft, fatty tissue inside your bones. 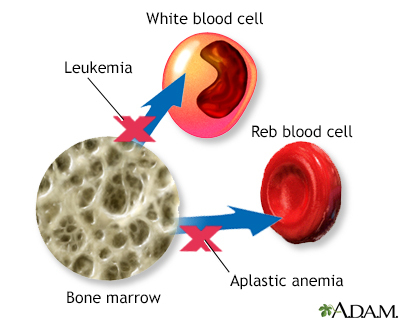 The bone marrow produces blood cells. Stem cells are immature cells in the bone marrow that give rise to all of your different blood cells. Radiation therapy uses high-powered x-rays, particles, or radioactive seeds to kill cancer cells. Ablative (myeloablative) treatment. High-dose chemotherapy, radiation, or both are given to kill any cancer cells. This also kills all healthy bone marrow that remains, and allows new stem cells to grow in the bone marrow. Reduced intensity treatment, also called a mini transplant. Lower doses of chemotherapy and radiation are given before a transplant. This allows older people, and those with other health problems to have a transplant. Autologous bone marrow transplant. The term auto means self. Stem cells are removed from you before you receive high-dose chemotherapy or radiation treatment. The stem cells are stored in a freezer. After high-dose chemotherapy or radiation treatments, your stems cells are put back in your body to make normal blood cells. This is called a rescue transplant. Allogeneic bone marrow transplant. The term allo means other. Stem cells are removed from another person, called a donor. Most times, the donor's genes must at least partly match your genes. Special tests are done to see if a donor is a good match for you. A brother or sister is most likely to be a good match. Sometimes parents, children, and other relatives are good matches. Donors who are not related to you, yet still match, may be found through national bone marrow registries. Umbilical cord blood transplant. This is a type of allogeneic transplant. Stem cells are removed from a newborn baby's umbilical cord right after birth. The stem cells are frozen and stored until they are needed for a transplant. Umbilical cord blood cells are very immature so there is less of a need for perfect matching. Due to the smaller number of stem cells, blood counts take much longer to recover. Leukapheresis. First, the donor is given several days of shots to help stem cells move from the bone marrow into the blood. During leukapheresis, blood is removed from the donor through an IV line. The part of white blood cells that contains stem cells is then separated in a machine and removed to be later given to the recipient. The red blood cells are returned to the donor. A bone marrow transplant replaces bone marrow that is either not working properly or has been destroyed (ablated) by chemotherapy or radiation. Doctors believe that for many cancers, the donor's white blood cells may attack any remaining cancer cells, similar to when white cells attack bacteria or viruses when fighting an infection. Certain cancers, such as leukemia, lymphoma, myelodysplasia, or multiple myeloma. A disease that affects the production of bone marrow cells, such as aplastic anemia, congenital neutropenia, severe immune system illnesses, sickle cell anemia, or thalassemia. Graft-versus-host disease (GVHD) is a life-threatening complication that can occur after certain stem cell or bone marrow transplants. Your provider will ask about your medical history and do a physical exam. You will have many tests before treatment begins. Before transplant, you will have 1 or 2 tubes, called catheters, inserted into a blood vessel in your neck or arms. This tube allows you to receive treatments, fluids, and sometimes nutrition. It is also used to draw blood. Your provider will likely discuss the emotional stress of having a bone marrow transplant. You may want to meet with a counselor. It is important to talk to your family and children to help them understand what to expect. 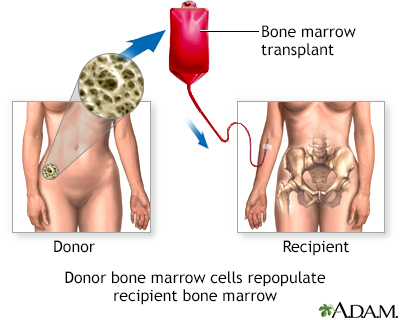 A bone marrow transplant is usually done in a hospital or medical center that specializes in such treatment. Most of the time, you stay in a special bone marrow transplant unit in the center. This is to limit your chance of getting an infection. Depending on the treatment and where it is done, all or part of an autologous or allogeneic transplant may be done as an outpatient. This means you do not have to stay in the hospital overnight. The health care team will closely monitor your blood count and vital signs. You will receive medicines to prevent GVHD and prevent or treat infections, including antibiotics, antifungals, and antiviral medicine. You will likely need many blood transfusions. You will be fed through a vein (IV) until you can eat by mouth and stomach side effects and mouth sores have gone away. After you leave the hospital, be sure to follow instructions on how to care for yourself at home. A bone marrow transplant may completely or partially cure your illness. If the transplant is a success, you can go back to most of your normal activities as soon as you feel well enough. Usually it takes up to 1 year to recover fully, depending on what complications occur. Complications or failure of the bone marrow transplant can lead to death. Bashir Q, Champlin R. Hematopoietic stem cell transplantation. In: Niederhuber JE, Armitage JO, Doroshow JH, Kastan MB, Tepper JE, eds. Abeloff's Clinical Oncology. 5th ed. Philadelphia, PA: Elsevier Saunders; 2014:chap 30. Heslop HE. Overview and choice of donor of hematopoietic stem cell transplantation. In: Hoffman R, Benz EJ, Silberstein LE, et al, eds. Hematology: Basic Principles and Practice. 7th ed. Philadelphia, PA: Elsevier; 2018:chap 103. Bone marrow may be harvested from the hip (iliac bone) to serve as bone grafts elsewhere in the body. Reviewed By: Todd Gersten, MD, Hematology/Oncology, Florida Cancer Specialists & Research Institute, Wellington, FL. Review provided by VeriMed Healthcare Network. Internal review and update on 11/06/2018 by David Zieve, MD, MHA, Medical Director, Brenda Conaway, Editorial Director, and the A.D.A.M. Editorial team.